Donald and Peggy Vogel bought an undeveloped six-acre lot in 1953 with hopes of transforming it into a haven for art lovers. After spending some time building a frame shop and home (which they dubbed the Valley House), the Vogels launched their new business venture, becoming one of the earliest dealers of modern art in the state. And Valley House’s status grew quickly. Thanks to a connection to French art dealer Ambroise Vollard’s estate, the gallery displayed paintings by modern masters like Monet, Renoir, and Cezanne in its early years. Today, Valley House is in the hands of the Vogels’ son Kevin and his wife, Cheryl, but the reputation for excellence has never wavered. Early Texas art from the likes of Charles Bowling and L.O. Griffith are complemented by works by contemporary artists, many of whom also have ties to Texas. The gallery holds a full schedule of monthlong exhibitions each year, like “The Loneliest Road in America,” featuring Lloyd Brown’s oil paintings of a notoriously barren stretch of Highway 50. 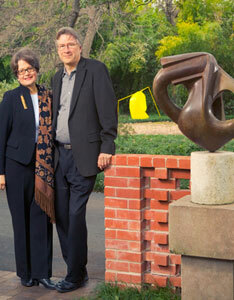 The 4.5-acre sculpture garden offers dozens of abstract and representational pieces.